Head to Schubas this Wednesday, December 17, to sample three bands on Urbana, IL-based label Parasol Records. The Tractor Kings, Beaujolais and New Ruins will make up a night of some of the latest and greatest Illinois-bred rock, from moody indie pop to alt-country. 18 and over, $7 at door. Click here for more info. 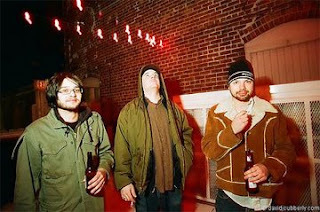 Formed in 1998, Tractor Kings are one of Champaign-Urbana's most notable bands. "Homesick," their newly released third record, showcases the band's ability to effectively blend spacey folk rock with alt-country Americana and psychedelia. Listen to: "Never Comin' Back," "Ferris Wheels"
Beaujolais is Joe Ziemba, formerly of Chicago bands The Like Young, Wolfie and Busytoby. On his recently released solo record, "Love at Thirty," Ziemba delivers a conceptual record fueled by the failed marriage with his former bandmate Amanda Lyons. Emotional and harrowing, but featuring a strong melodic sense throughout, the record is a satisfying and powerful listen. Listen to: "May I Have the Honor," "Birthday Card"
Last year, Champaign-Urbana band New Ruins released their debut album, "The Sound They Make," self-dubbed "Smalltown Midwestern Gothic." While the album is not without pop hooks, the music brims with an overall gloomy, wintry feel that perfectly captures small town malaise.